Jerome Powell delivered the market a stunning message on Wednesday when he revealed interest rates are closer to neutral than previously thought. While a powerful message and one that could send the dollar shooting lower it was not all that unexpected. Data over the last two months has shown a notable downturn in economic activity as interest rates weigh on sentiment. Along with this, inflationary evidence shows upward pressures are abating. What this means for the FOMC is that the interest rates are working and fear of future rate hikes is keeping activity in check. The Fed had been expecting to raise rates as many as four times by next December but that number has fallen drastically. The PCE Price Index, the FOMC’s favored tool for monitoring inflation, was released the day after Powell’s speech and reinforced his message. Economic activity continues to expand, driven by improvements in wages and spending, while inflationary pressures abate. The US dollar made some big moves in the wake of this news but remains within trading ranges in most cases. 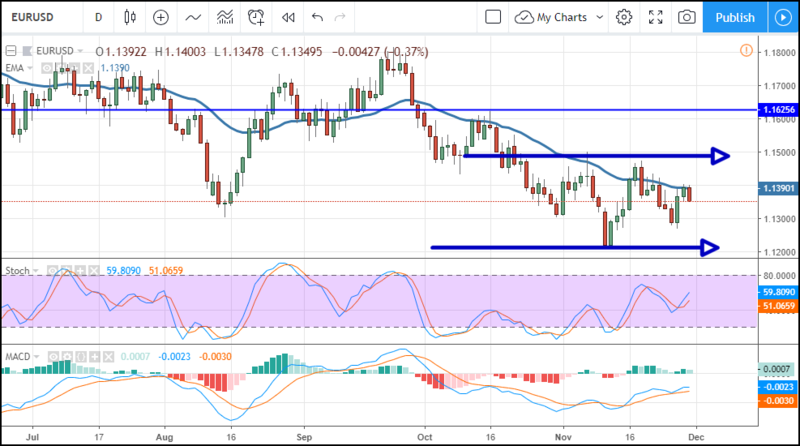 The EUR/USD found some resistance at the 1.14000 level, near the mid-point of a 30-day range, and looks like it will continue to wind up within this range. The focus now is the central banks. Data in both the EU and the US suggest growth is slowing a bit faster than expected and both central banks could turn dovish. The ECB is expected to end its bond-buying program this month and give a semi-hawkish outlook regarding rates. The FOMC is expected to raise rates a quarter point but also give a dovish outlook, a combination that could send the dollar moving much lower versus the EUR. If so, the EUR/USD could move up to 1.1500 or 1.1600 in the near to short-term. The ECB and FOMC meetings are in three weeks, until then be wary of whipsaw as markets eye data and the G-20 meeting over the weekend.